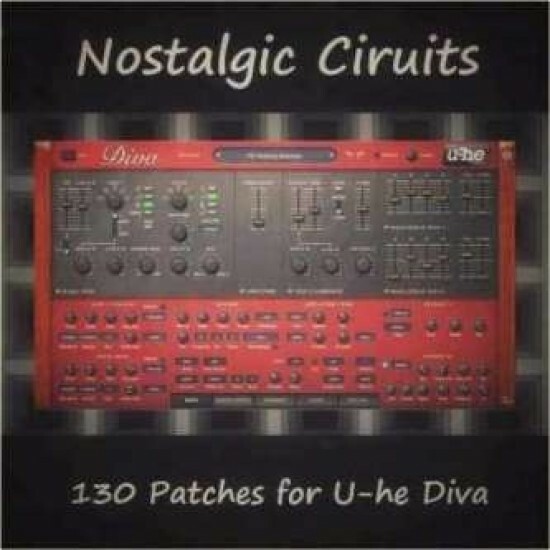 DIVA - Nostalgic Circuits - Support Artists, improve productions, enter the void. 'Nostalgic Circuits' is a collection of 130 presets for U-he DIVA, and a gold mine for anyone who loves the sounds of the 70s and 80s. You will find plenty of butter..
'Nostalgic Circuits' is a collection of 130 presets for U-he DIVA, and a gold mine for anyone who loves the sounds of the 70s and 80s. You will find plenty of buttery, vintage ear-candy in here, useful for a very wide variety of musical genres, but all patches having that distinctively old school character. Bryan 'Xenos' Lee has worked as a sound designer for such companies as Native Instruments, Cakewalk, Rob Papen Inspiration Soundware, ReFX, Camel Audio, Image-Line and many more. His work is found in several Maschine expansions and the factory presets of such synths as Z3ta 2, Alchemy, Kontour, Rounds, Gladiator, Punch, Toxic Biohazard, Scanned Synth Pro 2, Chipsounds, DCAM Synth Squad, D.I.V.A., etc. He is also very active in developing his own brand, Xenos Soundworks.